YouTube XL, as the 'XL' in the name suggests is a new version of youtube that makes the mother website, YouTube.com available on TVs and Large Computer screens, sans the 'Comments & Suggestion' clutter. Instead you will just have videos grouped into various categories such as Recently Added, Most Popular, Most Rated, etc. and a sleek Search Bar. In addition to this you have options for customised settings and SignIn. 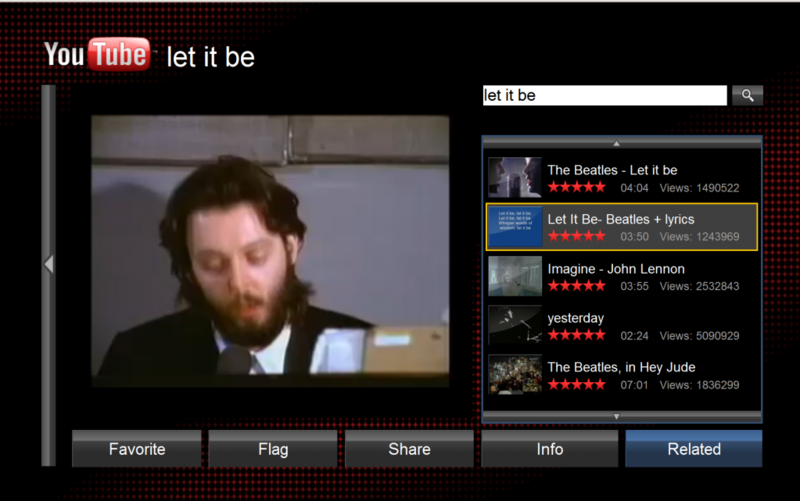 We watched the famous video 'Let It Be - The Beatles' on the new YouTubeXL. Click on the image to look how it looked like on a 22inch Wide Monitor. In customised settings you can choose to play the next video automatically when the current video ends and so on thus giving you a total TV experience. Then you can filter videos according to geographical locations and Language. You may also cho0se NOT to show videos that are not suitable for minors. Below we have included screenshots of YouTube XL as seen on a 22" Wide Screen Monitor. Mike says YouTube XL is extremely accessible as it will work on any device with a web browser.